The UA Percussion Studio is one of the most active and forward-thinking studios in the country. There’s always something exciting happening. Famed Drummer, John Riley, comes to the FFSoM! 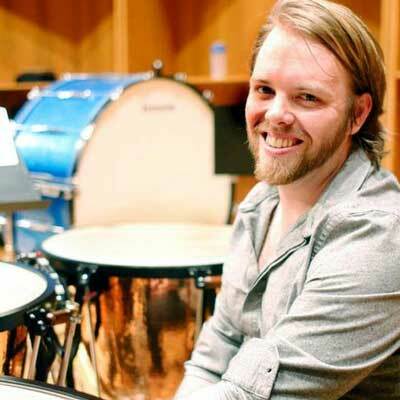 Acclaimed percussionist and UA percussion studio alumni, Trevor Barroero, won the Principle Percussionist position with the Orlando Philharmonic Orchestra in October, 2018. Way to go Trevor! Junior Percussionist, Claire Thorpe, front line percussion with DCI 2018 Champions, Santa Clara Vanguard! UA percussionist, and Center Snare for the Pride of Arizona, Claire Thorpe, was a member of the front line for the DCI 2018 Champions, Santa Clara Vanguard! Way to go Claire! Born in Canada, Morris Palter’s wide-range of musical interests have found him performing throughout North America, Asia, and Europe at some of the most prominent festivals and venues including Carnegie Hall, the Royal College of Music (London, UK), the Quincena Festival (Spain), Disney Hall (Los Angeles), and IRCAM (Paris). Morris was faculty at the Roots and Rhizomes percussion program (Banff Centre for the Arts) in 2011 and has commissioned and/or premiered hundreds of new compositions, working with both notable composers and new compositional voices. 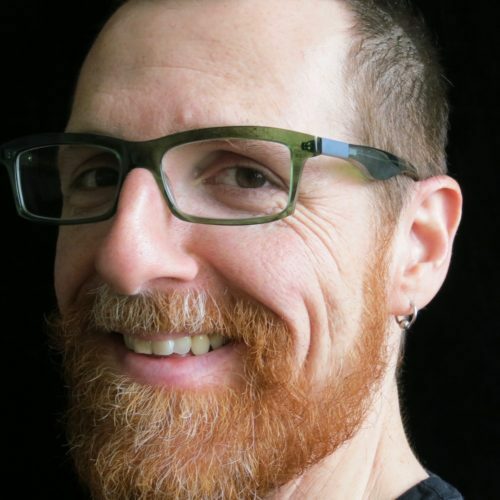 In 2000, Morris co-founded NOISE (San Diego New Music), and was a member of the redfish bluefish percussion ensemble from 1999-2005. In 2010, Morris was host and director of the Focus Day of Percussion at the Percussive Arts Society International Convention, and is currently endorsed by Black Swamp Percussion, Sabian Cymbals, and is a Yamaha Performing Artist. Morris is an associate professor of music at the University of Alaska Fairbanks, and a visiting associate professor of music at the University of Arizona during the 2016-17 academic-year. 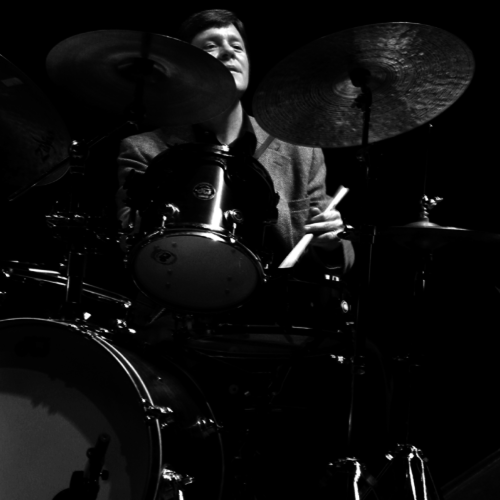 Jacob Ransom is a well-known and familiar local drummer, teacher, percussionist, and world music aficionado. 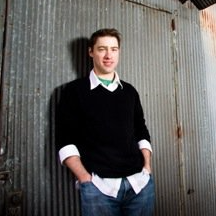 Jacob was born in Tulsa, Oklahoma, moved to the beautiful town of Ashland Oregon where he was raised as well receiving his bachelors of music degree from Southern Oregon University. Jacob received his Master of Music degree from the University Alaska of Fairbanks. Michael Pratt currently serves as a Graduate Teaching Assistant at The University of Arizona. He is working toward a DMA in performance with a minor in Ethnomusicology while studying with Dr. Morris Palter. He teaches undergraduate lessons, coaches the Rosewood Marimba Band, percussion ensemble and is the Associate Director of the UA Steel Band. 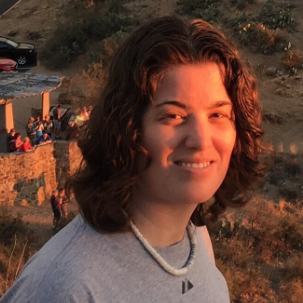 Suzie currently serves as a Percussion Education TA DMA candidate at the University of Arizona. Suzie recently served as adjunct faculty at Kaskaskia College and Greenville College in Southern Illinois, teaching courses in percussion ensemble, percussion lessons, percussion methods, and general music education. March 22 – 23 – FFSoM – Percussive Arts Society, Arizona Weekend of Percussion – featuring John Riley (drum set), and Sean Dowgray (percussion). 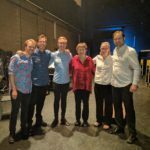 Works performed will include Dmaathen (Iannis Xenakis), Etudes Apercues (Betsy Jolas), Toucher (Vinko Globokar), Woven (Greg Harrison – world premiere), and a selection of novelty ragtime xylophone tunes. Guests include Matthew Tropman (tuba), and Eddie Goodman (soprano saxophone). Works from Casey Cangelosi, Askell Masson, Robert Aldridge, and steel pan tunes. Works from Pius Chung, David Lang, and others. Works from G.H. Green, Russell Hartenberger, and others. The Percussion Group meets from 7-9 a.m. on Tuesdays and 6-8 p.m. on Thursdays. We also meet most Fridays from 4-5 p.m. on Fridays in room 170 of the School of Music. The percussion ensemble is open to any percussionist at the UA who wishes to perform on a regular basis. 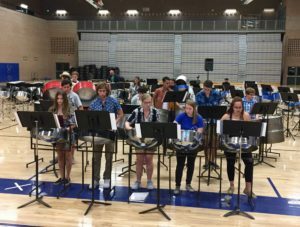 The ensemble provides the student with the opportunity to perform and become familiar with the ever-growing volume of percussion ensemble literature. Composing and conducting opportunities will also be presented and encouraged. The ensemble presents public performances and clinic sessions each semester. 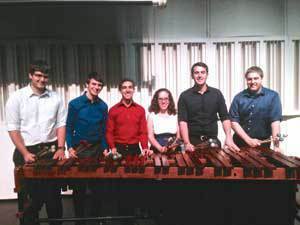 Participation in the percussion ensemble is expected as many semesters as possible in order for the student to acquaint him or herself with the vast literature and techniques of the percussion ensemble. The steel band program at the UA is one of the oldest and most respected in the country. The program offers any student who shows ability and desire to perform on pans the opportunity to explore the rich traditions of Trinidadian steel band music as well as classical and pop transcriptions. 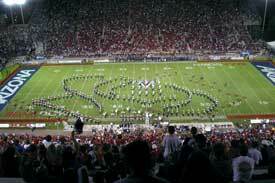 The band rehearses on Monday and Wednesday evenings and is open to any qualified students enrolled at UA. Membership and enrollment permission is granted through permission of Dr. Morris Palter, the Director of the UA Steel Bands program, after an orientation/audition assessment of a student’s ability. No previous steel band experience is necessary; however, good time with a natural ability to groove and knowledge of note reading, scales, and chords is helpful..! CrossTalk is a select group of students who comprise the only performance group of its kind in the world today. The philosophy of the ensemble is to create and perform new works and offer new musical experiences with electronic percussion technology. In CrossTalk, students gain knowledge and experience working with the newest cutting-edge electronic percussion instruments. Students write, arrange, program, and produce compositions that are performed live. Membership in CrossTalk is open to any UA students interested in exploring new technology and by permission of director, Dr. Morris Palter. The World Music Gang focuses its repertoire on traditional music from other cultures. Entirely taught through oral tradition, the ensemble members are given the opportunity to experience the learning process without written music. While the focus of the Gang is musical, the cultural contexts relevant to the music studied are inherently stressed giving the students and the audience a deeper understanding of its meaning and personal enjoyment to the music played. 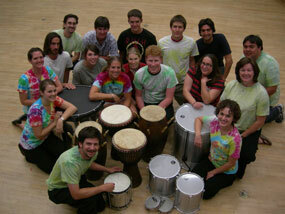 The World Music Gang has been performing on the UA campus since its formation in 2003. The group is directed by Chris Wabich, a recognized expert in world music. 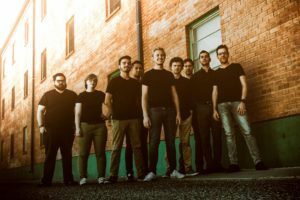 Rosewood is a select group of students who perform the classic ragtime arrangements of Green, Breuer, Joplin, and others as well as classical and folk transcriptions. 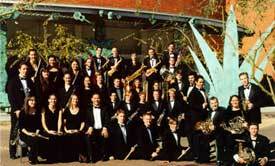 Additionally, Rosewood performs the finest original contemporary works for marimba and keyboard ensembles. Rosewood presents many performances each semester around the Southwest and is recognized as one of the outstanding ensembles in the School of Music. Membership is through competitive audition each fall and credit is through the Percussion Ensemble class. 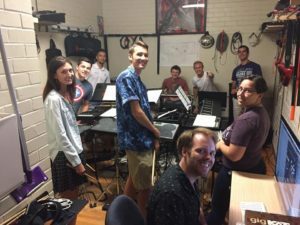 Malleus is the newest chamber ensemble in the UA Percussion Studio. It is comprised of DMA students enrolled in the studio and has at various times been a trio, quartet, and quintet. Students in Malleus are 100% responsible for every aspect of the group: picking repertoire, arranging rehearsals, scheduling concerts and concert promotion. This gives each member of Malleus the experience of running and managing a professional-style chamber ensemble. New for 2018, the Speak-Easy Xylophone Ragtime Band is directed by Ragtime xylophone specialist, Dr Morris Palter, and is comprised of between 8-10 percussion studio members for any one performance. The group will be performing three concerts in September and October 2018. Please check the concert calendar for details! To place the students’ understanding of the art of music in the context of the sister arts, history and culture. The Philharmonic returns Fall, 2016 to provide orchestral performance opportunities for School of Music students and members of the UA community. The Philharmonic is lead by Graduate Conducting Majors, and frequent sectional rehearsals lead by graduate assistants emphasize the improvement of technical and ensemble skills. 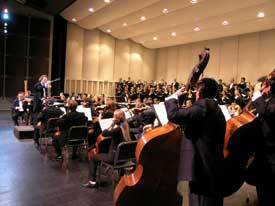 The orchestra performs two concerts a semester in Crowder Hall. Chad Shoopman, Associate Director of Bands Wind Symphony is an outstanding concert band of approximately 75 members that performs a wide variety of literature including classic band repertoire, famous orchestral transcriptions, selections from film scores and musical theatre, and current wind literature. The ensemble has performed concert events such as Carl Orff’s Carmina Burana in conjunction with the UA Symphonic Choir, John Williams’ Star Wars, and An Evening of George Gershwin, featuring UA Professor Rex Woods as piano soloist on Rhapsody In Blue. Wind Symphony rehearses twice per week and performs two concerts per semester. Participation in this ensemble is selected by audition only. Symphonic Band is a large concert band which performs a variety of wind band literature and is geared toward musicians who desire a quality band experience, but have less time to commit. This ensemble is open to all interested students, staff, and faculty. Seating placement auditions are required. You do not have to be a music major to participate! There is a great diversity of students in this ensemble, most of whom want to continue to play their instrument in the University setting or even learn a secondary instrument. Angelo Versace, Director of Jazz Bands The University of Arizona has two large jazz groups: “Studio Jazz A” is led by Professor Angelo Versace and meets Monday, Wednesday, and Friday from 12:10 to 12:50. “Jazz B” rehearses on Tuesday and Thursday between 12:00 and 1:30. 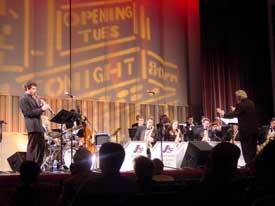 Students may also perform in a number of combos that rehearse and perform each semester. The mastery of a technical facility and understanding of concepts of phrasing that will enable the student to perform with sensitivity and musical expression on percussion instruments. The cultivation of an understanding of the interrelations of mental and physical (psycho-physiological) aspects involved in the learning of musical skills and the performance of music. Performance of a cross-section of the very best literature in all styles and areas of percussion. The development of the ability to read at sight. Experience in solo and ensemble performance. Regular attendance and participation in weekly percussion master classes and recitals. The cultivation of an understanding of teaching procedure and practice, pedagogical systems, and rehearsal and conducting techniques. Observation of the working procedure in the private studio, master classes, and ensemble rehearsals is relevant to these goals. Reflect his or her progressive understanding and mastery of tone production and technical development on the respective percussion instruments. This should include concepts of rhythmic understanding, dynamic observance and control, technical velocity, pitch accuracy, and articulation and phrasing with touch and finesse. Continually demonstrate an awareness of the mental aspects involved in achieving high quality musical expression in performance and teaching. Show a clear understanding of the selected music with regards to musical style and form, including the ability to verbalize about the historical relevance and placement of the piece, the tonal framework and/or compositional techniques employed. Performance should be stylistically correct with regard to the rhythmic, articulation and phrasing concepts of the period and style. Be musically meaningful considering the student’s instinctive talents and level of achievement. Visit music.arizona.edu for more information and degree plan options. Requirements for Undergraduate Admission into Percussion Studies and Scholarship Consideration: A personal audition with the percussion faculty or an audio/video recording is required to determine the student’s ability and acceptance into the studio. A student should be able to demonstrate proficiency in at least two of the following four main areas of percussion performance for entrance into the Percussion Studio and in at least three of the areas to be considered for scholarship. 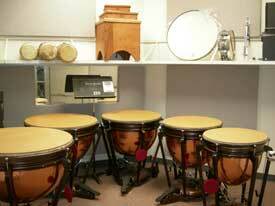 Scholarships in the Percussion Studio are based on ability and future potential. Concert-style: A published concert-style solo or etude from Anthony Cirone’s Portraits in Rhythm, Jacques Delecluse’s Twelve Etudes for Snare Drum (Douze Etudes pour Caisse-Claire), Vic Firth’s The Solo Snare Drummer, or equivalent. Select material that best represents your musical and technical development such as control of rhythm, dynamics, expression, rolls, ornaments, and touch. Rudimental-style: A published rudimental-style solo or etude from Charles Wilcoxon’s The All American Drummer, John Pratt’s Fourteen Rudimental Contest Solos, Edward Freytag’s Rudimental Cookbook, Scott Johnson’s Progression, or equivalent. Select material that best represents your musical and technical development such as control of a wide variety and style of rudiments and rolls, control of dynamics, physical dexterity, expression, accuracy of rhythm, and touch. Two Mallets: A published two-mallet solo or etude from Morris Goldenberg’s Modern School for Xylophone, Marimba and Vibraphone, Garwood Waley’s Recital Pieces for Mallets, Thomas McMillan’s Fundamental Studies for Mallets or equivalent. Select material that best represents your musical and technical development such as control of rhythm, dynamics, expression, rolls, tone quality, and touch. Four Mallets: A published four-mallet solo or etude from James Moyer’s Four-Mallet Method for Marimba, Bart Quartier’s Image, Nancy Zeltsman’s Four Mallet Marimba Playing, Mark Ford’s Marimba:Technique Through Music, or equivalent. Select material that best represents your musical and technical development such as control of rhythm, dynamics, expression, rolls, tone quality, and touch. A published solo or etude from Saul Goodman’s Modern Method for Timpani, Garwood Whaley’s Musical Studies for the Intermediate Timpanist, Mitchell Peters’ Fundamental Method for Timpani, or equivalent. Select material that best represents your musical and technical development such as control of rhythm, dynamics, expression, rolls, tuning skills, tone quality, and touch. A published solo or a demonstation of musical styles including jazz, rock, and contemporary world-music styles (Afro-Cuban, Braziian, etc.) This demonstration should include the ability to play time, improvising fills and solos, and chart reading. The audition will help determine personnel best qualified for these ensembles as well as give all auditionees the experience of preparing and taking a professional audition. The audition will consist of only the prepared orchestral excerpts as specified in the audition list and highlighted. If you are a new student, or have not formally studied excerpts, you will need to prepare yourself as best you can on the excerpts and play the Bach selection. Apply your own good musical sense about rhythm and technique, get a score and study the excerpts for musical context, and listen to several recordings for style, tempo and phrasing. Do your best for your ability and experience. Auditions will be held Saturday, August 18th, 2018 starting at 9:00 a.m. in room 170 with Dr. Palter and the Graduate TA’s. Auditions will be screened. All instruments will be provided at the audition site. Players may bring their own instruments if preferred but must be set up before their playing time. (Room 170 is reserved for percussionists starting at 8:00 a.m. on August 18th.) Persons auditioning found to be less than prepared will be dismissed from the audition. Individuals will be ranked in order of playing ability. Individuals will be allowed to pick the large ensemble they would like to play in, going in order of rank. IMPORTANT NOTE – there is no guarantee you will be awarded your top choice. This may be due a number of reasons including too many/too little percussionists in any one ensemble, or non-music related class conflicts. That said, every attempt will be made to place you in your ensemble of choice. Please review the hours that these ensembles meet in order to avoid class conflicts. Find some good recordings (i.e., major orchestras, well known conductors, great percussionists), listen to as many recordings of the same excerpt as possible for the phrasing, tempo, style, texture (blend or soloistic), musical context, etc. Make study files/CDs and play alongs and practice with them. Online music sites such as Spotify and even YouTube can be great sources of recordings. Master the “mechanics” of the ink – rhythm, notes, dynamics, technical issues, etc. with a metronome. Decide on stickings or specialized performing techniques for the best phrasing and accuracy. Then “go beyond the ink” and make music with a beautiful sound and musical phrasing played with finesse and a refined touch. Room 110 is the largest room in the percussion area. It is used for storage of larger keyboard percussion instruments as well as for small ensemble rehearsals and large multiple-percussion setups. Room 110A is the main teaching studio. 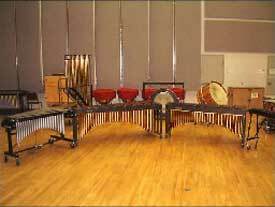 It contains a set of four Yamaha Timpani, a Marimba One 5 octave marimba with upgraded bars and Basso Bravo resonators, and three snare drums. In addition, 110-A houses a digital video camera, a digital audio recorder, a stereo system, a DVD system, and hundreds of videos of student performances. 110-A also features a Apple computer with M-Audio keyboard and a variety of software for notation and sequencing. Room 110B is primarily a multiple-percussion practice room. 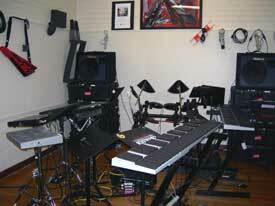 It contains a number of different instruments includings drums, cymbals, blocks, and various keyboards. 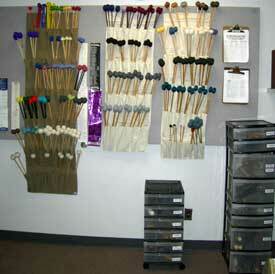 In this room, students can set up a multiple-percussion piece and have the instruments available on a regular basis. 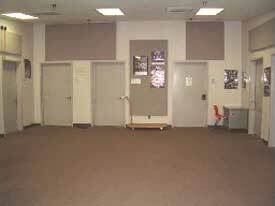 Students often use this room to practice percussion excerpts for snare drum, xylophone, orchestra bells, and hand percussion. Room 110C is where our second 5.0 Octave Marimba One lives. 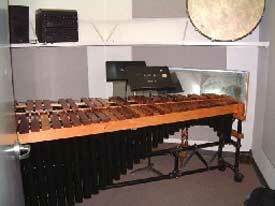 This is a beautiful instrument and features Marimba One's newest height adjustment technology. 110D is where our 5.0 Octave Mallet Tech marimba lives. This is an older instrument with fantastic bars. 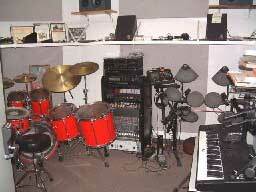 Room 110E is the drumset teaching studio. 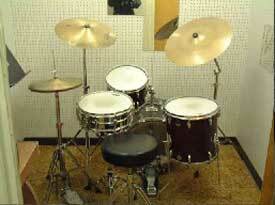 It is also used by students practicing drum set and electronic drum set. It features complete Yamaha acoustic and electronic kit along with a stereo system. 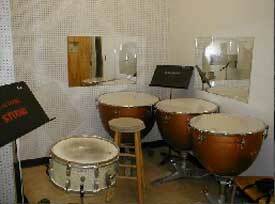 Room 110F is primarily a timpani practice room. It contains at new set of Adams Hammered Kettle Bowls. It also contains a snare drum for practice and storage for some talking drums and square drums from Ghana. Room 110G is the Graduate Teaching Assistants' Office. It contains the UA Mallet Library, the UA Video Library, an audio system and a computer system. 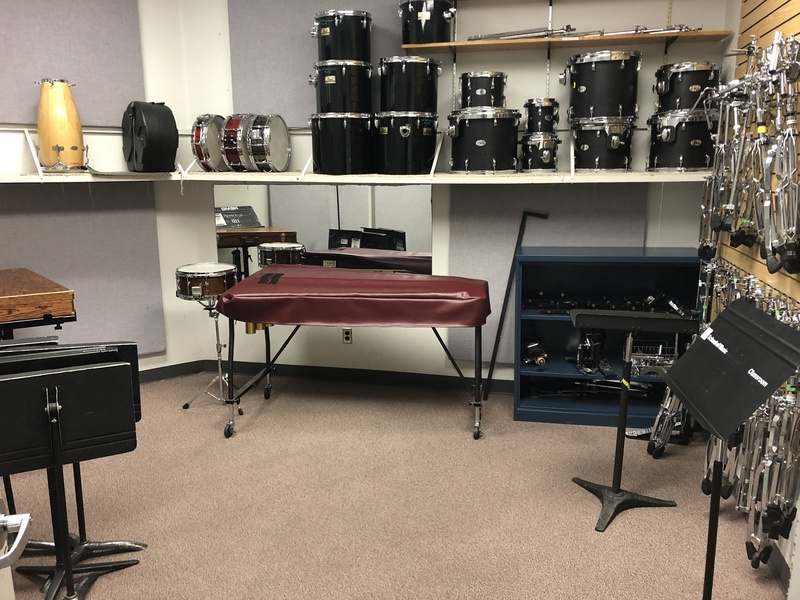 Room 48 is in the lower level of the music building and is used primarily for multiple-percussion practice and electronic drumset practice. It contains a CD player and several method books for student practice. Room 50 is also located in the lower level and contains a beautiful vintage "baby" Gretch drum set for student practice. 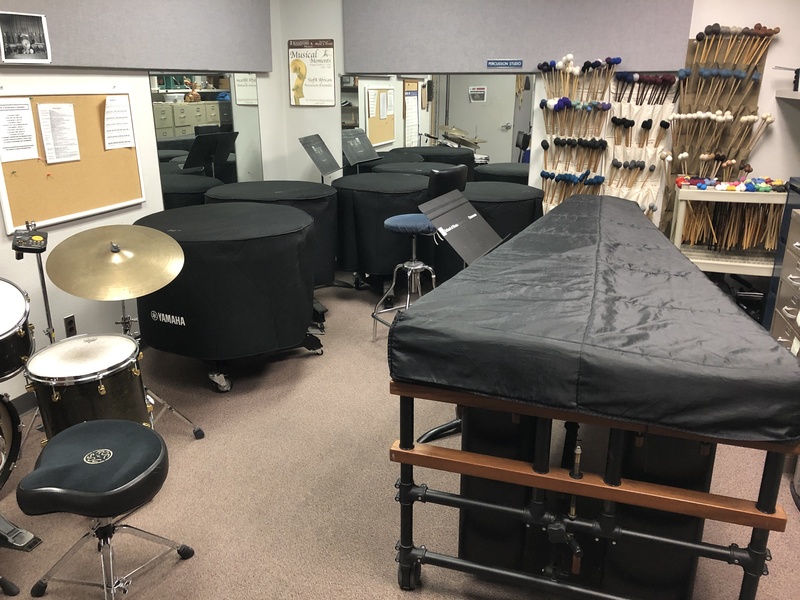 Room 52 is for general percussion practice and contains a 4.3 Octave Musser marimba, snare drum, and a set of Adams Revolution timpani. Room 170 is the large instrumental rehearsal room. The UA Percussion Ensembles and World Music Gang rehearse here, as does the Wind Ensemble and the UA Symphony Orchestra. 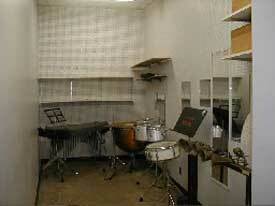 The room is available for percussion practice during the evening and on weekends by reservation. 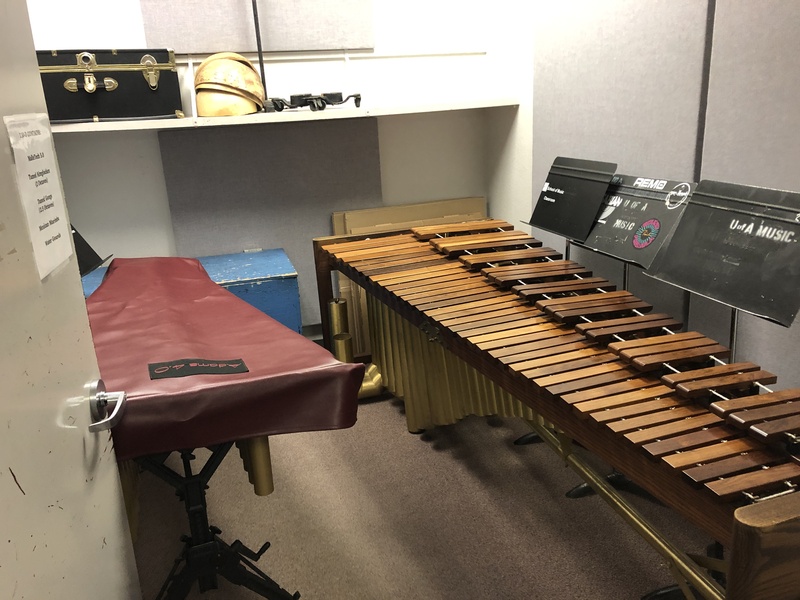 It contains both Ringer and Adams Philharmonic timpani, marimbas, xylophones, vibraphones, bass drums, other large percussion instruments, and a large stand case called "Monstro". 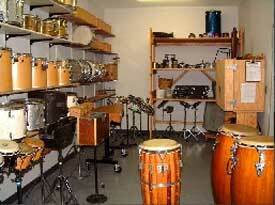 Room 170A is our main percussion storage room off of Room 170. 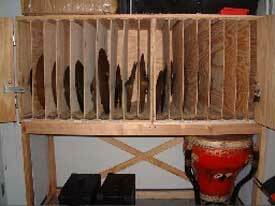 It is dedicated to percussion storage of drums, tam tams and gongs, orchestra bells, crotales, a drum set, and assorted hand percussion. Room 170B is a storage room off of Room 170 that is used for storage of our "Cymbal Vault", our Yamaha Maple Custom drum set and a few other unique percussion instruments. Room 218 is dedicated for CrossTalk rehearsals and individual practice/programming for members of CrossTalk and other students in the percussion studio.